Transportation demand studies is an important research interest of the TRANS committee. Investigating factors influencing demand within the National Capital Region (NCR), such as demographic and geographic characteristics, and addressing their implications on demand and transportation infrastructure is an important part of the TRANS portfolio. Historically, TRANS has published a number of reports on transportation demand in the NCR. In 2011, the TRANS committee undertook the NCR Travel Trend Study (part 1, part 2 and 3), which investigated regional and inter-provincial travel trends in the NCR – particularly in the context of the 2005 origin-destination (OD) survey, as well as 1986 and 1995 OD surveys. Trends drawn this way were then used to create projections for ongoing travel patterns. For instance, the study found that while jobs were largely concentrated in a few districts, the places of residence of the labour force were much more broadly distributed. 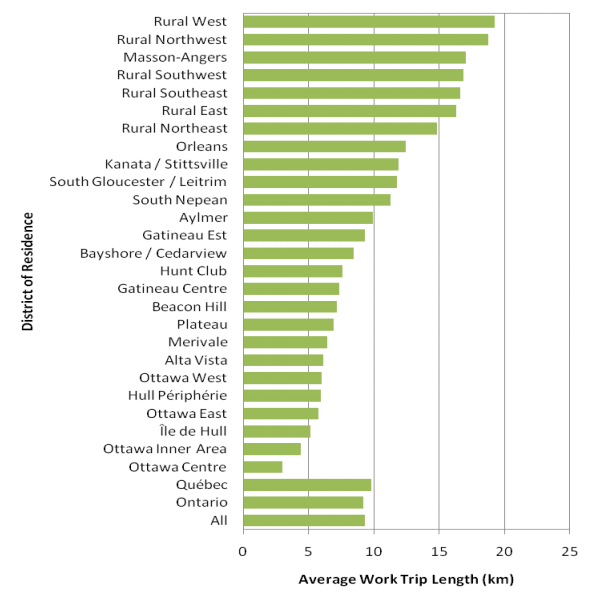 The figure below examines how commute length varies throughout the NCR. The study also tied transit usage to key demographic factors such as area density, household auto ownership, and trip purpose. The study examined traffic flow between districts, and the variation in number of trips by time of day.